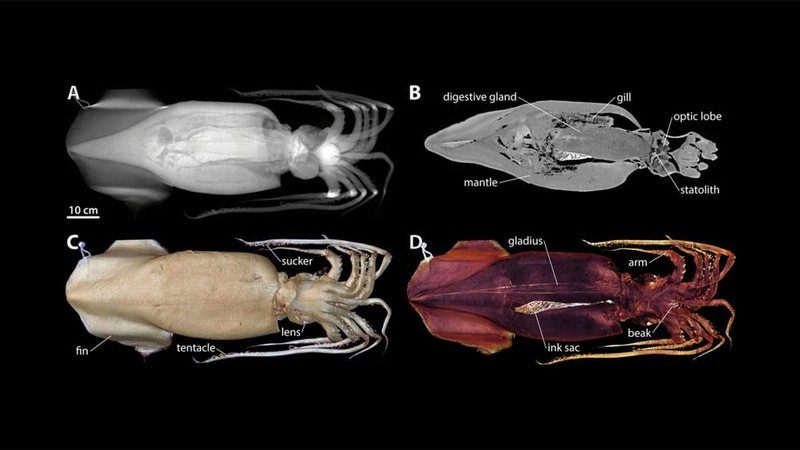 Woods Hole Oceanographic Institution (WHOI) scientists are using advanced medical imaging techniques and diagnostic tools to reveal the internal structures of a wide range of marine animals. Most recently they worked on an international collaboration on mollusks: a diverse group of invertebrate sea creatures that includes snails, clams, mussels, squid, and octopuses. The resulting images, made from digitally reconstructed radiographs (DRR), computed tomography (CT) scans, and magnetic resonance imaging (MRI), provide researchers with a non-destructive, non-invasive way to view the internal organs of animals in three dimensions—something that previously was only available by using conventional dissection methods. A paper published recently in the journal American Malacological Bulletin highlights stunning imagery from more than 20 scanned specimens ranging in size from a few millimeters to over one meter. The image above is of a Humboldt squid (Dosidicus), which is the largest of the mollusks imaged. Using software and special digital techniques, the 3D datasets can be magnified, rotated and tilted, and viewed on a computer in tandem with other datasets, which enables researchers to make direct comparisons of animal morphology and anatomy. All of the imagery is open access and available in a repository at Morphobank. Funding for this study was provided by the Ocean Life Institute, the Office of Naval Research, the Seaver Institute, the Helmholtz Foundation, and the Deutsche Forschungsgemeinschaft.